The brit-pop band Black Coffee put the night into a more energetic swing. With the lead singer donning a cushty looking “Teenage Riot” sweater, he swings his hands along to the groovy tune of “Hoah”, sounds reminiscent of The Clash, with the guitarist making some wacky effects to intro the song. Strong, catchy vocals moved along to a disco, brit-pop beat that made me think of Blur, and the swinging movements of the singer eventually got the audience shuffling their feet. The second song “Utopia”, another Clash-sounding song featured trashy drums, a raw and crunchy sounding guitar and overall a very good feeling noisy sound, featuring a punk sounding solo with a powerful bassline. The third song “Madchester” featured a punky drum intro, drawing in a few people to the front. Coarse sounding vocals filled the PA with lots of zany effects sung by the guitar. The fourth song “Michelle” sounded a lot like the Foo Fighters song ‘Everlong’. A lot more people were coming and formed a semi circle in front of the stage, intrigued by the catchy beats and poppy interlude. The set was bridged by the fifth song “Jesse Smiles”, a song featuring catchy bass riffs and the singer switching to lead guitars, jamming out a poppy chord progression with a very Oasis feel to it. Next came the song “Honeybomb”, a 90s feeling song with mass distortion, a solid beat with trashy cymbals, and a sharp, raw guitar sound, with a very catchy chorus. 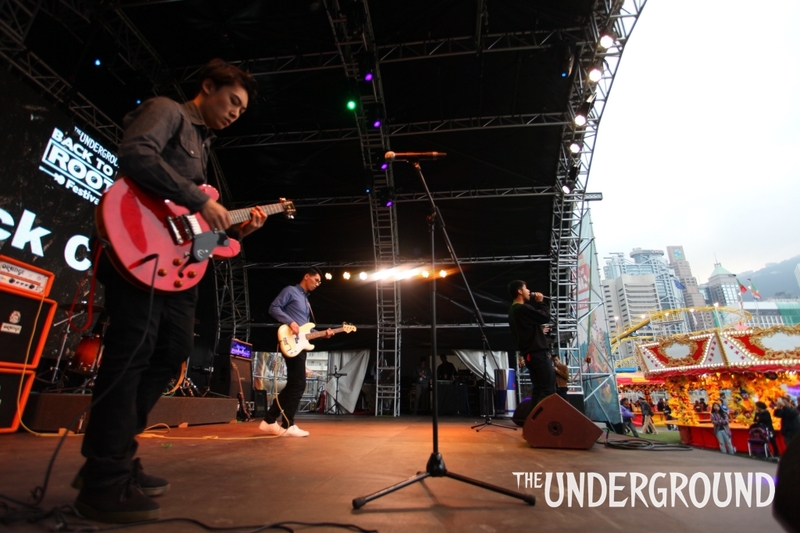 The band ended with killer song “Monday Morning Blues”, featuring shoutouts to co-workers, friends and crew, the song had a floaty, almost hovering feel to it, again featuring the vocalists lazy-sounding vocals and a stoic looking guitarist. Black Coffee felt like the perfect Oasis/Blur mashup, building up intensity in all the right places, ending the set with a long feedback outro. Some bands, for some reasons best known to them, do not like classifying their musical style, which I guess is fine but not particularly helpful to potential listeners. Black Coffee proudly calls itself a Brit pop/rock band and boy, there is no question about it. While “Brit pop/rock” is a very loose classification, but a listener is left in no doubt that this band is heavily influenced by the music from that little town next to the great city of Liverpool, namely, Manchester, specifically bands like the Stone Roses and Oasis (one of their songs is even named after that town), but without the excesses of the commercially obligatory soft ballads. 25 minutes of full on, unapologetic distortion. The band has only been playing together for about 6 months, but what they do, they do well – it just seems to come so naturally to them, with the lead singer, Mario, having a voice that is particularly suited this style of music. Although musically there are no surprises, they provide great entertainment, regardless of whether you are a fan of the sound from that little town next to Liverpool.